1 cup pitted dates soaked in 1 cup of water for 30 minutes to soften. (May be soaked overnight and kept in the refrigerator). 1. In food processor, process dates and the cup of soak water. Process for 2 minutes until smooth. 2. Add the wet sunflower seeds and the soak water. (Tthis water is full of enzymes and nutrients). Process for 2 minutes until it becomes a thick and "butter-like" consistency. 3. Add coconut oil and process for 2 minutes. The consistency should be a thick and textured. 4. Add in walnuts and pulse for 30 seconds. You want the walnuts to maintain chunkiness in the batter. 5. Add the chia seeds and process. (The chia will begin to become gelatinous and bind the mixture.) Process for 1 minute. 6. Add the tahini and process for 1 minute. 7. Add all of the powders; maca, cacao, lucuma, mesquite, coconut palm sugar and process for another minute to mix thoroughly throughout the batter. 8. Transfer to a bowl. Fold in dried sunflower seeds and goji berries. 9. Spread batter into a 12 inch non-stick baking dish. Or grease a regular baking dish with a bit of additional coconut oil. 10. Cover and freeze for 1 hour. 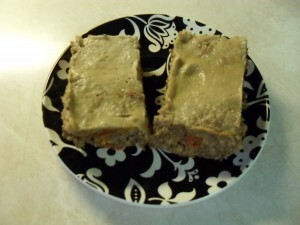 After 1 hour, cut into bars and refrigerate. Will last for 10 days of grab and go snacks. Or keep in freezer to maintain freshness longer. Enjoy! Let us know what you think of this easy vegan recipe: Raw Gluten-Free Superfood Power Bars!